The Xperia X Compact sports a 4.6-inch 720p display. The Z3 Compact made the jump to 4.6 inches from the Z1's 4.3 inches, and the lineup hasn't grown in screen size since. It doesn't have to - after all, that's the whole point of Compacts. The 720p resolution stretched on that diagonal results in 319ppi - if the iPhone can live with that for 7 generations now, the X Compact will somehow manage without breaking ppi records as well. The Xperia X Compact can shine as bright as 534nits, a number virtually identical to the one posted by the Xperia X. It's not as bright as the Z5 Compact (quite a wide margin, actually), but last year's model can't match the X Compact's contrast, achieved in no small part by keeping blacks in check. The minimum brightness of 4.7nits is very good and nighttime reading shouldn't be an issue. The Sony Xperia X Compact did splendidly in our sunlight legibility test. The score it posted is well into AMOLED territory (okay, not where the very best of AMOLEDs reside, but still) and it's right there with the best of LCDs (iphone 6s, for example). There's inconclusive evidence as to the scratch-resistance of the X Compact's display. The official white paper, detailing all specs and features, doesn't mention any protection. Official Sony Mobile websites state Corning Gorilla Glass, but without specifying the generation. Despite the discrepancy, the phone might as well have such protection. We're trying to get to the bottom of it, and we'll update you on it once we have confirmation. Beyond the outer layer lie a host of proprietary display technologies. Triluminous is Sony's trademark for what is commonly known as a Quantum dot display, a variation of LCD panels that deliver a wider color gamut. It generates colors in a different way than vanilla LCD's and even if you're used to AMOLED's punch, you won't be left wanting here. On the software side, Sony does image post-processing in its gallery under the label of X-reality engine. You can turn it off, switch to X-Reality mode or go all in with Super-vivid mode. You can get a side-by-side comparison to help you make your choice too. You also get a White balance option in the menu, where you can adjust the colors via RGB sliders but you need to have a calibration tool as you likely won't be able to improve anything going by eye alone. Even then you won't get significantly more accurate results as the sliders only allow you to add to the mix of primary colors and not take any away. 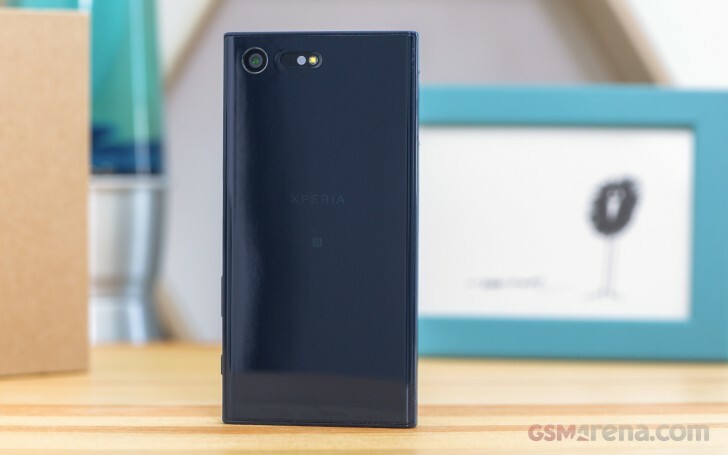 The Xperia X Compact doesn't come lacking in connectivity options, though it's not up to the XZ's level - rather it matches the Xperia X due to the same chipset being used. For mobile data you get LTE Cat. 6 (300Mbps down, 50Mbps up) along with HSPA as a fallback (42.2Mbps/5.76Mbps). Local connectivity includes dual-band Wi-Fi a/b/g/n/ac, Bluetooth 4.2 with aptX and Low Energy and NFC. There's an FM Radio receiver with RDS - you can't find that on the flagship. The Wi-Fi connection can be used for screen casting - be it Miracast, Google Cast, or DLNA. If you connect a DualShock controller, the Xperia XZ can even double as a portable console streaming your Playstation 4 games via PS4 Remote Play. It can also connect to your car's stereo system via MirrorLink. GPS, GLONASS and BeiDou satellite positioning is supported, unless you're in the US, where it's just GPS and GLONASS. The USB port is Type-C, but it only conforms to USB 2.0 spec and not 3.0 or 3.1. It lets you hook up USB storage and accessories, but you'll need to select the data transfer mode every time you connect it to a PC, as it defaults to charge only, which is somewhat annoying but we guess it's there for a reason or use case we can quite think of. Sony has dropped MHL support, so you have no wired way to output an image to a TV. You do get 3.5mm analog output to your choice of headphones. The Sony Xperia X Compact is powered by a 2,700mAh battery, the same capacity as both the Xperia Z5 Compact and a little more than the Xperia X proper. Seeing as how the X has a larger and higher-res display, but still did a respectable job in the endurance department, we expected the X Compact to truly impress. Indeed, it posted very good scores in our tests, perhaps with the exception of talk time. That said, the 14 and a quarter hours that we got on a 3G call match Sony's promise in the X Compact's documentation proving that it can replicate the lab results in real life. Move from calls to screen-on tasks and the Xperia X Compact does a better job. In Wi-Fi web browsing it's good for 11 and a half hours, with the 9 minutes by which it outlasts the Z5 Compact easily within the margin of error. That's still 2 hours longer than the Xperia X's 9:34h - so our initial logic that a smaller lower-res display would help the X Compact outlast the X holds true here, at least. Not quite in video playback, where the X Compact posts virtually the same (already good) result as the regular X. The Xperia Z5 Compact could last a good 3 hours longer while playing videos. It's worth keeping in mind, however, that the Z5 Compact was tested before we adopted the standardized 200-nit brightness, and it was instead set at 50% of maximum, which meant 106 nits in its particular case. The individual scores above (plus the standby draw we test, but don't include in the scorecard) add up to a combined endurance rating of 73 hours. As all members of the new X series, the Xperia X Compact has the Qnovo adaptive charging built-in. The technology allows the phone to monitor the cell's electrochemical processes in real time and adjust charging parameters accordingly to minimize cell damage and extend the battery unit's lifespan. Qnovo claims the battery should last hundreds of charge cycles more than a conventionally charged battery. This means a year or so of extra longevity as in theory if the battery ages better, it should hopefully be able to hold charge better in time (an important aspect for a phone that has its battery sealed-in). Battery Care is another proprietary Sony feature. It won't be universally available though, so if it sounds like something you might be interested in, check back with your local Sony rep. The handset also supports the Qualcomm QuickCharge 3.0 (and, of course, 2.0), but we're not sure if it will come bundled with a charger to match. It will most probably be a regional thing. On the software side of things, there's Sony's Stamina battery saving feature. It has two modes: regular Stamina, and Ultra Stamina. The first disables non-essential features like GPS and vibration, and takes performance down a notch. Ultra Stamina is for absolutely dire occasions when you don't expect to be near a power outlet for a long period of time. Enable that and it's back to basics - meaning a single homescreen with access to the dialer and contacts, text messages, camera and clock. Going out of Ultra Stamina requires a restart.